In today’s review we’re taking a look at another set in the first wave of 2013’s Class I Fleet line. The 501st Legion Attack Dropship with Clone Pilot and Battle Droid is both wonderful and frustrating at the same time. It’s a brilliant new take on a fantastic “Hasbro concept” vehicle that never saw proper distribution when it was released in 2012. However, the lackluster pack-in figures could prove to be a deal breaker for many. Read on to find out if this is a set you’ll want to deploy in your collection or if you should just let it fly by. Description: A 501st Legion attack dropship flown by a 501st Legion Clone Pilot deploys troopers into combat against Battle Droids. Bearing the iconic markings of the elite 501st Legion, the dropship has cannons and chin guns to drill deep into battle zones. The pilot briefly lands with the ship's cockpit rotated into deploy position to drop up to two troopers onto the field before flying back into the air to provide ground support. The figures included in the 501st Legion AT-RT Class I Fleet set are kind of silly. The figures included with the 501st Legion Attack Dropship in this very bizarre Class I Fleet set are ABSURD and even slightly maddening. The dropship itself, however, is one of Hasbro's finest creations. Like many others, I still never managed to locate the original Republic Attack Dropship with Clone Pilot Class I Fleet set when it was released last year. For whatever reason Hasbro insists on inundating our toy lines with repacks and carry-forwards which leave little to no room for the newer stuff to make it to retail. The distribution of last year's dropship was completely disastrous, so it is very nice to see this repaint released in Wave 1 of the 2013 Class I Fleet because so far it has much better availability than its predecessor. Every collector should make sure they own at least one version of this vehicle, because it really is outstanding. The attack dropship is a concept Hasbro came up with; it has never appeared in any Star Wars media other than the toy line. And that's perfectly fine. This really gives it that classic vintage Kenner "mini-rig" feel, and the design is extremely well done. It incorporates a lot of scaled down features of both the Republic Gunship and the LAAT (Low Altitude Assault Transport) carrier gunship. As with its wavemate, the 501st Legion AT-RT, the deco looks amazing. The ship's markings are the perfect "501st" shade of blue and other little details such as the Republic logo and the "501" designation printed on the left wing in Aurebesh look terrific as well. This is one heavily armed little ship, featuring six laser cannons. Of these six, the two attached to the wings are the only functional missile-firing launchers. The two forward cannons are able to rotate independently of one another. There is also an additional cannon underneath the vehicle that cleverly doubles as landing gear for when the dropship is in troop deploy mode. The flight and deploy modes both look great, and the troop deployment is a very well-executed action feature that doesn’t interfere with the aesthetics of the ship at all. The figures in the Class I sets are very lightly accessorized. 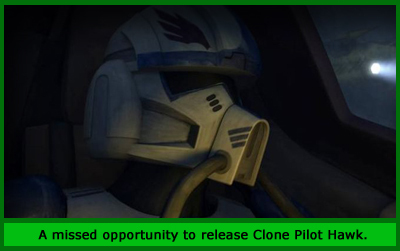 The Clone Pilot comes with a removable helmet and a blaster, and the Battle Droid includes a blaster and its backpack can be unplugged. The reason to buy this set is for the Attack Dropship, because the figures stink bantha poop. I consider this set a missed opportunity to give us a couple more animated figures from the “Umbara” arc of The Clone Wars (in which case the 501st Legion designation would actually make sense). In particular, this was the character of Clone Pilot Hawk’s best shot at finally being made. He would have been absolutely perfect for this set. 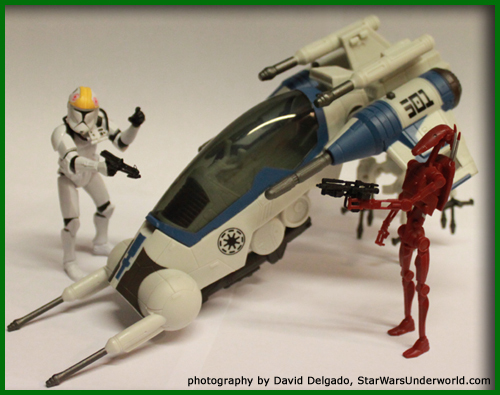 Hasbro set a precedent for including specific clone pilot characters from the show with “mini-rig” concepts in the Class I line when they released Warthog with the Y-Wing Scout Bomber in 2011. It’s such a shame they missed this opportunity here. If they wanted to do something EXTRA cool, they could have included that General Krell figure - that we know they made but has since been postponed indefinitely - in either this set or its wavemate the 501st Legion AT-RT as the “enemy” figure. Regardless of how bad the included figures are, the dropship is a must-have. If you’re lucky enough to already own the previous version of the Attack Dropship, then you’ll have to decide for yourself whether the 501st Legion repaint is worth the $23.99 price tag. 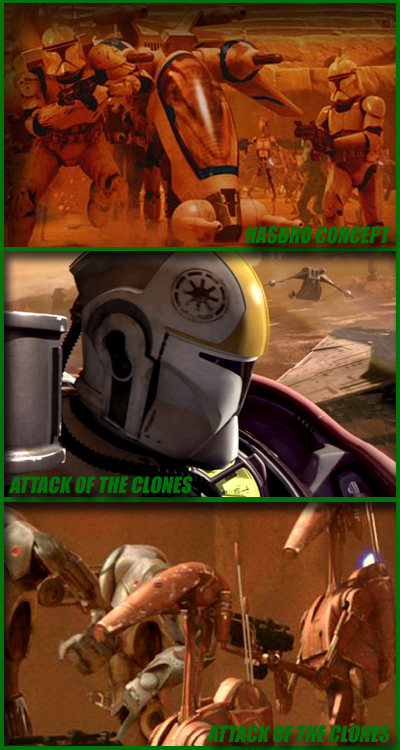 I think this version looks incredibly cool though, and I’m sure it would make a fantastic addition to your Republic army. In future waves of the Class I line, Hasbro will need to make better pack-in figure selections if these sets are going to attain widespread appeal and justify the $23.99 price point. With logical, quality figure choices alongside these awesome “mini-rigs,” the Class I sets can potentially be a super deal for kids, parents, and collectors. Fantastic review!!! Very good photography work as well.